and talking abo ut fish and stuff and I told him that I am a vegetarian and then he asked me whether I would eat rice. I told him that I eat rice very seldom (may be once in a week or even two weeks:), an d I eat oat meal and then he asked me which type and I answered old fashioned, I know that is better than processed/instant oats, then he inquired about steel cut. I ate steel cut long time ago and I know that is the best type of oats which are more nutritious and healthier. But the problem is it takes long time to cook. That is the reason I stepped back from using them. But immediately I decided to shift back to ‘steel cut oats’ for many reasons but I want to add some spice to it and that is how this dish has taken birth. I usually cook biryanis either in pressure or rice cooker. I used pressure cooker for this. so I directly put all ingredients in the pressure cooker container. 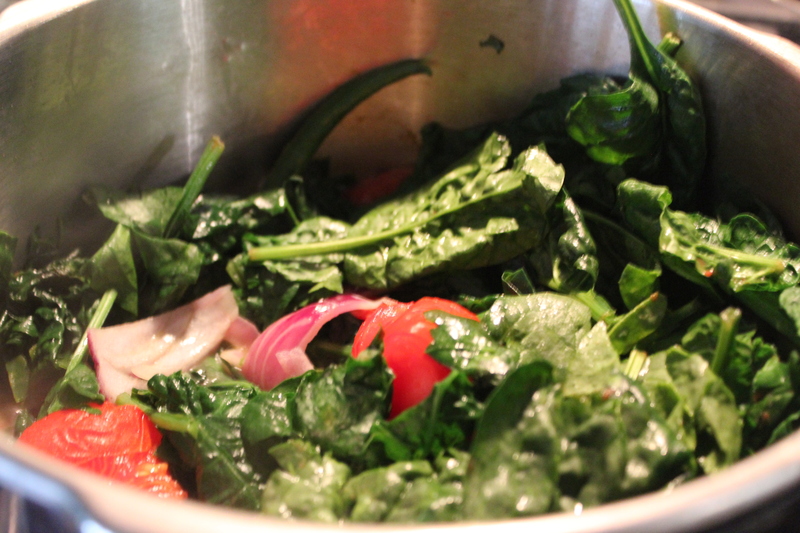 Saute onion pieces, cloves, cardamom, cinnamon in 5 to 6 table spoons of ghee and once they turn little brown, add tomato ( I cut each tomato into two pieces) pieces and cook for 2 to 3 minutes and add the spinach and let them all cook for 5 minutes. Then add salt, and dhania powder, cumin p owder. Mince ginger, garlic, coconut pieces and green chillies and add that paste to the curry and let it cook for another 2 minutes. 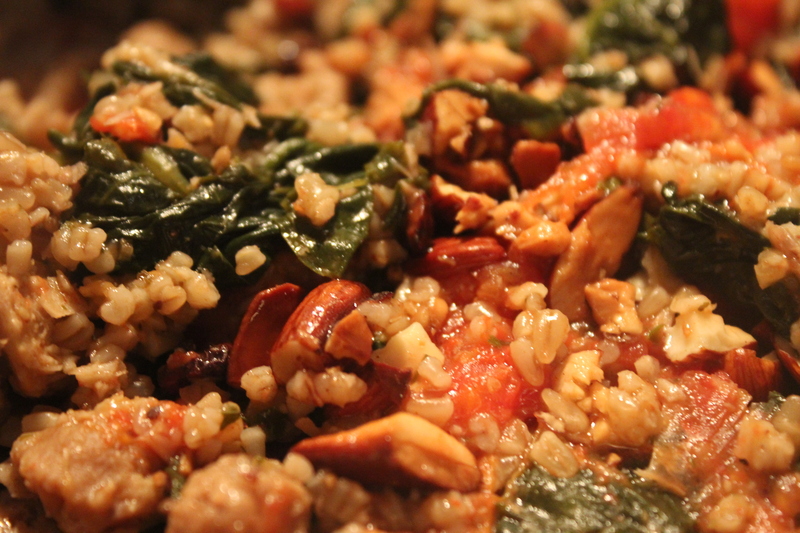 Then add oats and mix it well and let them cook for a minute. Add add water (usually I use one and half cups of water for one cup of rice, but for steel cut oats, i used 2 cups of water to a cup of oats. And basically in my pressure cooker (and with my new cooking range which has one power burners), the biryani would be done in 10 minutes. And I sautéed cashew and almonds (make them into small pieces) in two spoons of ghee and add it the biryani after it is done. So on all the whole it would take close to 30 min (10 minutes for preparing and cutting vegetables, 10 minutes in pressure cooker, may be 10 minutes or less for the cooling time). I think after Ashta Chemma and Ala Modalindi, this is another movie of Nani I really enjoyed. Very simple, clean comedy throughout the movie. There are many scenes in the movie where we laugh very naturally. If we do not seriously scrutinize hero’s character, we would definitely enjoy the movie. Shankar Dada scene is hilarious and there are many scenes those evoke laughter. And the hero’s cell caller tune is ‘Bhalae Bhale Magadivoy’ for us not to forget the title of the movie. Two songs have a typical classical touch. on the eve of Teacher’s Day, I have been trying to recollect teachers who have a strong influence on me from my early childhood, 50 years flashback ….takes some time…. I do not recollect any teachers that have any great impact on me or may be I am not looking for teachers or teachings that constrain us in the four closed walls. I am looking for someone who inspired me as role models, who shaped me as a good human being irrespective of so many mistakes I have done. Of course, for anyone, parents take the front seat and the environment we grow in and the person we share our life with. I am not an exception, my parents and my husband always take the front seats. With out them teaching anything explicitly, I have learnt a lot from them. I give all the credit to those three people very proudly. of course like any parents, amma and nanna told me what to do what not to do. But beyond those, I have learnt many things from them which were ever told explicitly – the simplicity, and patience from amma – we are eight siblings and I am the youngest and my house is an open house, always house full – any body can come at any time. and they hadn’t left the house without having food. My dad is the principal of the college and my father’s friends kids were also sent to this college (they have come all the way from Guntur district to Anakapalli as they have so much faith in my dad and his discipline) I never ever remembered my mom being irritated or impatient to cook for almost 20 people on average everyday. My dad was a chemistry lecturer besides being the principal of the college. physical chemistry is at the tip of his tongue and he could just teach it without any book. He taught chemistry to many students without taking any fees even after his retirement. That is the passion I look for in any teacher. He was very passionate about gardening too. In our college campus, there were many gardens, he made sure he walked through out the campus in the morning not only having his rounds throughout the campus but also to make sure all the plants are being watered properly. He was true Gandhite and he wore white khadi pancha and lalchi throughout his life. I read/heard somewhere that we do not teach kids anything explicitly but they learn from parents’ actions, behaviours and everything parents do. So they are undoubtedly our best teachers, molders of our character, our role models and our mentors. Since I have started my volunteer activities in 2008, I have met many students (adults) who have changed my perspective of life and I have learnt many things from them – their patience, persistence, dedication, love towards life in many adverse situations. 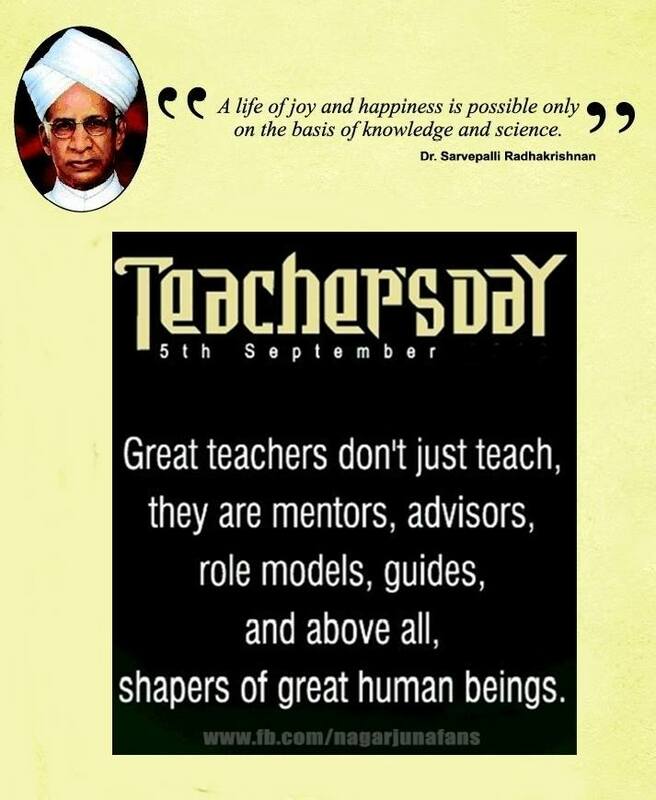 Learnt from many people what to do and learnt also from so many what not to do and this learning is a continuous process in the life and for all those who made me a better human being – Happy Teachers Day !